I’d booked a double-lesson slot, so I just about had time for a quick drink after lesson 5 and then we went straight in to the pre-brief for lesson 6. The first part of the lesson will be about slow flight. It’s not designed to encourage slow flight, but rather make you aware of symptoms of flight at critically low airspeeds, and being able to control the aircraft safely at a slow airspeed whilst accelerating to faster airspeed (such as when recovering from an unintentional loss of airspeed). After the first HASELL checks, subsequent checks can be reduced to HELL. A well-known aviation writer was once asked what he considered the three most important factors in flight safety. He replied “Airspeed, airspeed and airspeed”; and he’s got a point. The standard stall recovery is to lower the nose and apply full power. If one wing drops, do not attempt to use the ailerons to level the wings – this will make things worse. Use opposite rudder whilst keeping the control column centralised. You don’t even need to use power to recover from a stall – pushing the nose forward is enough. However, power can be used to accelerate the recovery and reduce height loss. Power should always be a secondary measure (to lowering the nose). I’ll be doing some more radio in this flight too. So, pre-flight briefing complete, it’s back out to the apron and in to the plane, and another round of checks. I waited for a suitable gap in the radio, pressed transmit and made my transmission – saying everything correct except the QNH. In the heat of the moment, for some reason I said “Q-N-H ten-twenty”. What I should have said (and I do know this from all the revision I’ve been doing) is “Q-N-H one-zero-two-zero” but I got it wrong. Luckily they understood what I meant and the response clarified I had the correct QNH by saying “Aeros 52, Gloucester Tower, QNH one zero two zero, taxy alpha one”. Ten twenty – it’s as if I was telling the time. What an idiot! After taxying to near the holding point, we did our pre-take off vital actions and power checks. Everything good, so I was back on the radio saying “Aeros five two, alpha one, ready for departure”. Soon after that, we were cleared to take-off, we were on the runaway and I was pulling back on the yoke. I forgot to switch on the GoPro until mid-flight, but from memory we did our HASEL checks, several exercises at slow speed (remembering to turn with a very small angle of bank – 10 degrees or so, we don’t want to stall!) and then moved on to the stall exercises after doing a FREDA check. 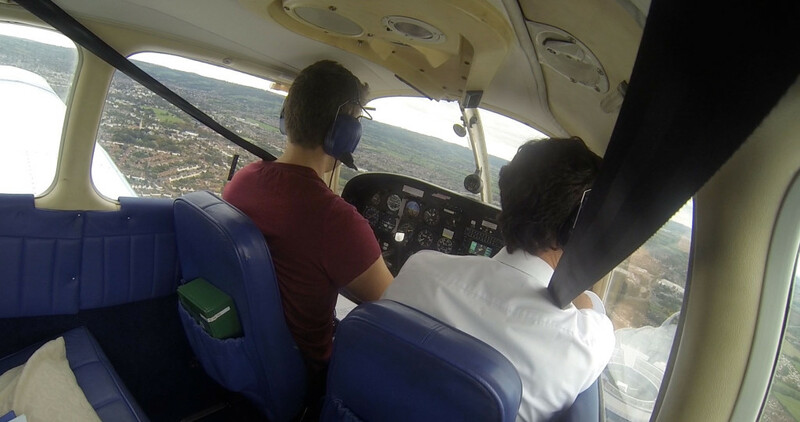 We experienced quite a lot of turbulence around the Malverns, making for a rather bumpy and unpleasant flight until we turned away and in to some better space. This was a fairly short lesson so after the instructor was happy that I’d done everything correctly, we headed back towards the airfield and joined the circuit on right base. I turned to final, set full flaps and altered attitude to maintain 65kts, using power to control the descent. I was too low this time – four reds on the PAPI – so increased power to correct things. Height corrected, the wind was blowing (12 kts) which made for a trickier landing than any I’ve done before. I was ok down to about 50 feet then the instructor took over as I had lost a bit of airspeed – I think the wind was distracting me (or causing some effect I have not yet learnt about!?). Back safely on the ground, we taxyed to the fuel pumps, refuelled and had a quick de-brief. The instructor was happy with my performance in the exercises but reminded me again to keep my hand on the throttle during take-off. Must really try not to make this mistake again next time. Next lesson will be stalling part two, then we’ll be moving on to circuits!